right -- or brown dwarfs like LP 944-20. On May 21, 2014, astronomers announced the identification of the closest M7 (+/- 0.5) red dwarf star 2MASS J154043.42-510135.7 at only about 14.4 light-years (4.4 parsecs) from Sol based on a trigonometric parallax measurement. Lithium absorption at 670.8 nm sugest that the star is over 600 million years old with more than 0.06 Solar-mass. (Perez-Garrido et al, 2014). On August 18, 2014, a team of astronomers submitted a preprint revealing the potential detection of one new star believed to be possibly located within 20 light-years. TYC 3980-1081-1 appears to be located at 5.93 pc. It is probably a dim red dwarf star (Finch et al, 2014). On April 25, 2014, astronomer Kevin L. Luhman announced the discovery of an extremely dim brown dwarf around 7.2 +0.8/-0.7 light-years (2.20+0.24/-0.20 pc) from our Sun, Sol, using infrared images collected by NASA's Wide-field Infrared Survey Explorer (WISE) . Designated WISE J085510.83-071442.5 (but can be shortened to WISE 0855-0714), the substellar object is the fourth closest to the Solar System. At an estiamted temperature between minus 54 and 9 degrees Fahrenheit (minus 48 to minus 13 degrees Celsius), the object is the coldest brown dwarf discovered as of April 25, 2014, as the previous coldest dwarfs were no colder than room temperature. Also the reddest as well as coldest brown dwarf known, it should probably be classified as a "Y" dwarf (NASA JPL news release; NASA science news; and Kevin L. Luhman, 2014). On February 6, 2014, a team of astronomers submitted a preprint which revealed their detection of a brown dwarf which is roughly estimated to located between 13 to 26 light-years (3.9-8.0 pc) from of our Sun, Sol. Found using data from the Wide-field Infrared Survey Explorer (WISE), an infrared space telescope, the cool and methane-rich, T8 dwarf has been designated WISE J200050.19+362950.1 (which can be shorted to WISE J2000+3629). Lying near the galactic plane, the detection of J2000+3629 suggests that more such very dim brown dwarfs may await discovery (Cushing et al, 2014). On July 10, 2013, a team of astronomers submitted a preprint which revealed their detection of a brown dwarf which may be located around 16 +5/-4 light-years from of our Sun, Sol. Found using data from the Wide-field Infrared Survey Explorer (WISE), an infrared space telescope, the cool and methane-rich, T7.5 dwarf has been designated WISE J052126.29+102528.4 (shortened to WISE J0521+1025). The object's motion relative to the galactic core suggests that it belongs to the Milky Way's thin disk (Bihain et al, 2013). In addition to recently discovered red dwarfs (DENIS 1048-39 and Teegarden's Star) and brown dwarfs (Epsilon Indi ba and bb, Gliese 570 d and LP 944-20) listed in the Notable Nearby Stars page, preliminary distance estimates for the following celestial objects indicate that they also may be located within 20 ly of Sol, even if their physical characteristics are no longer considered to be unusual among nearby stars. On November 29, 2012, astronomers using data from a variety of space- and ground-based telescopes submitted a pre-print revealing the discovery of five new brown dwarfs that may be located with 20 light-years of our Sun, Sol, including four, very cool Y-class brown dwarfs (Marsh et al, 2012). On September 27, 2012, astronomers using data from the Wide-field Infrared Survey Explorer (WISE), an infrared space telescope, provided a pre-print revealing the discovery of a very cool, Y-class brown dwarf located only around 16 +/- 2 light-years of our Sun, Sol, among 13 such extremely dim and cool objects found in WISE data thus far. Designated WISE J163940.83-684738.6, the object's estimated distance places it among the "lowest luminosity sources detected to date." The object should be rich in surface methane as it was detected using "methane imaging techniques," relying on near-infrared observations with methane filters (Tinney et al, 2012). Sol in Constellation Lyra (more). 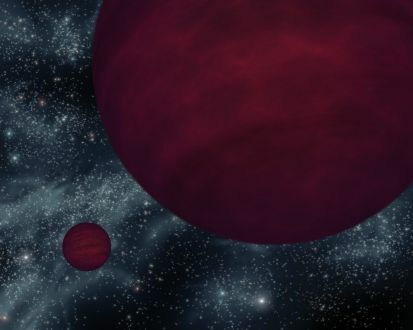 On August 24, 2011, astronomers using data from the Wide-field Infrared Survey Explorer (WISE), an infrared space telescope, announced that they found 100 new brown dwarfs, including six very cool, Y-class brown dwarfs within 40 light-years of our Sun, Sol. Y-dwarfs are the coldest members of the brown dwarf family, objects with too little mass to fuse atoms at their cores and thus are unable to fuse elements like hydrogen and helium that keep stars like Sol shining brightly for billions of years. Instead, brown dwarf cool and fade with time until they radiate light only at infrared wavelengths. While the atmospheres of brown dwarfs are similar to those of gas giant planets like Jupiter, but they can be easier to observe in space if they lack the blinding light of a parent star. 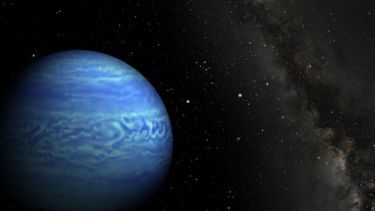 One of the Y dwarfs discovered, designated WISE 1541-2250, may only be located some nine light-years away in Constellation Lyra, while another (WISE 1828+2650) is so cool that its atmospheric temperature is estimated to be colder than room temperature at less than 80 degrees Fahrenheit, or 25 degrees Celsius. In addition, UGPS 0722-05 has been reclassified "as the T9 spectral standard" (NASA news release and science news; Astronomy Picture of the Day; Cushing et al, 2011; and Kirkpatrick et al, 2011). of the same atmospheric molecules. APOLOGIES: Special thanks to George Brettrager and Francisco J Aragoneses for pointing that I had failed to convert parsecs into light-years (as I had thought that I did) in my hasty calculations last week. As a result, Jao et al, 2011 (Table 1 and 2, pp. 25-27) actually measured the parallaxes of 10 red dwarf and subdwarf stars that are located within 20 parsecs (not light-years) of Sol. On June 17, 2010, a team of astronomers submitted a preprint on a relatively bright, methane brown dwarf that was recently found to be a nearby object. Classed as spectral type T6 and designated as DENIS J081730.0-61552 (or DENIS 0817 or DEN 0817-6155), the substellar object appears to be located only 16 +/-1 light-years from Sol, making it the third closest, isolated brown dwarf found as of June 2010. The object was found by "cross-matching the DENIS and 2MASS point-source catalogs" (Artigau et al, 2010). On April 2, 2010, a team of astronomers (including Phillip W. Lucas, Chris G. Tinney, Ben Burningham, Sandra K. Leggett, David J. Pinfield, Richard L. Smart, Hugh R.A. Jones, Federico Marocco, Robert J. Barber, Sergei N. Yurchenko, Jonathan Tennyson, Miki Ishii, Motohide Tamura, Avril C. Day-Jones, and Andrew Adamson) posted a pre-print on this newly found object after analyzing data observed by the UKIDSS Galactic Plane Survey (UGPS), which were obtained using the United Kingdom Infra-Red Telescope (UKIRT) in Hawaii. Designated UGPS J072227.51-054031.2 (or UGPS J0722-05 or UGPS 0722-05), this extremely dim celestial object may be one of the closest known solitary brown dwarfs to Sol at present, based on an updated distance estimate of around 13 +/- 2 light-years (4.1 +0.6/-0.5 parsecs) away from Sol (Ken Croswell, New Scientist, June 24, 2010; and Lucas et al, 2010) -- made after an initial estimate of as close as 9.5 +/- 1.3 light-years away. As this object was found in observations from only six percent of the sky, many more such objects are expected to be found as more data from the UKIRT Infrared Deep Sky Survey (UKIDSS) or the recently launched NASA Wide-field Infrared Survey Explorer (WISE) satellite are analyzed (Lucas et al, 2010; Ken Croswell, New Scientist, April 9, 2010 and June 24, 2010; and David Matson, Scientific American Blog, April 9, 2010). On December 9, 2008, a team of astronomers announced their determination that an extremely cool and dim, methane brown dwarf (designated since discovery in 1999 as 2MASS J09393548-2448279) may be composed of a pair of roughly equal sized objects. After three years of precise measurements with the Anglo-Australian Observatory in Australia, the hypothesized binary was determined to be located around 17 light-years away in Constellation Antlia. Both components of the T8 brown dwarf binary pair appear to be fairly cool with a surface temperature of only 565 to 635 degrees Kelvin (560 to 680 degrees Fahrenheit) but are twice as bright as other brown dwarfs of its temperature. Each object probably has around 30 to 40 Jupiter-masses (Spitzer press release; Rachel Courtland, New Scientist, December 10, 2008; Burgasser et al, 2008; Leggett et al, 2007; and Tinney et al, 2005). On November 14, 2006, a team of astronomers associated with the Cerro Tololo Inter-American Observatory Parallax Investigation (CTIOPI), a research program of the the Research Consortium on Nearby Stars (RECONS), announced their identification of 20 new stars located within 10 parsecs (pc), or 32.6 light-years (ly), of Sol (NOAO press release; and Henry et al, 2006b). This was an update of a July 2006 announcement (Henry et al, 2006a). While some stars were added to the 10-pc list, other stars and brown dwarfs were found to be farther away than previously measured. One red dwarf star was added to the list of stars within 20 ly. 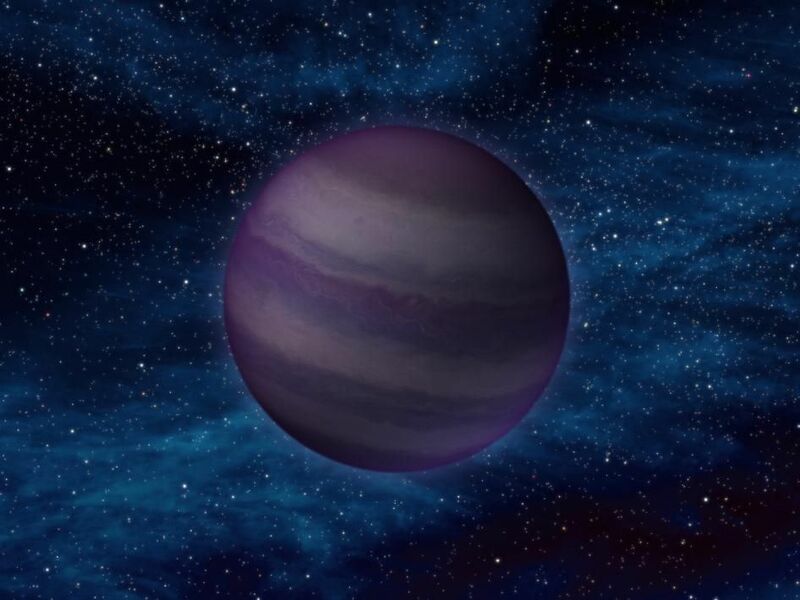 While some stars were added to the 10-pc list, other stars and brown dwarfs were found to be farther away than previously measured. 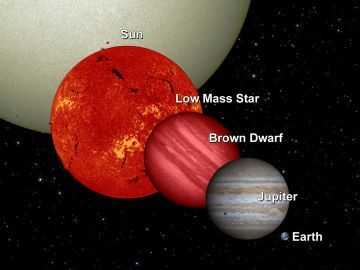 On August 1, 2006, astronomers (led by Edgardo Costa and Rene Mendez of the Universidad de Chile in Santiago) announced that an extremely dim M8.5 red dwarf should be reclassified as the closest known "L-type" brown dwarf in the Solar neighborhood. Originally discovered in 1999 by in images collected by the Deep Near-Infrared Survey (DENIS), the object was designated as DENIS or DEN 0255-4700, Located around 16.2 light-years (4.97 parsecs) from Sol in Constellation Eridanus (02:55:3.7-47:00:52, 2000), the substellar object is 100 million times dimmer than the Sun with a spectral type of L7.5 V, indicative of a cool object with a surface temperature of only 2,600 degrees F (1700 K). Spectral analysis of the object indicated that it has exotic elements such as potassium, rubidium, and cesium in its outer atmosphere, as well as superheated water (NOAO press release). RECONS has provided a preliminary mass estimate of 0.07 Solar-mass. On March 22, 2006, a team of astronomers (including Beth Biller, Laird Close, Markus Kasper, Wolfgang Brandner, and Stephan Kellner) using the European Southern Observatory's Very Large Telescope announced the detection of a cool methane brown dwarf (spectral type "T" 5.5 +/- 1) in orbit around the recently discovered, red dwarf star SCR 1845-6357 (ESO press release; and Biller et al, 2006). The object has between nine and 65 Jupiter-masses and a mean orbital distance of about 4.5 AUs from SCR 1845-6357, which was most recently estimated to be located only 12.6 +/- 0.1 light-years from Sol (Henry et al, 2006b; and Henry et al, 2006a). 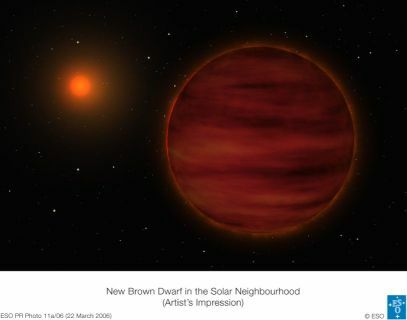 As of March 2006, SCR 1845-6357 may the 36th closest known star to Sol, while its brown dwarf companion "b" is the third closest known brown dwarf. In late 2004, astronomers (Niall Deacon, Nigel Hambly, and John Cooke of the University of Edinburgh) analyzing data from the Southern Infrared Proper Motion Survey announced the discovery of an extremely dim red dwarf star (M8 V), designated SIPS 1259-4336, that may be located only 11.8 +/- 1.8 light-years from Sol (Deacon et al, 2005). Given its atypical faintness, however, astronomer Todd Henry (Georgia State University and RECONS) suggests that the star may be actually be farther away, although probably located within 5 parsecs or 16.3 light-years (Ken Croswell, 2004). The star's discoverers proposed that the star's dimness could be explained if it was actually an unresolved double star. In February 2005, astronomer Todd Henry reported that RECONS was able to revise the measurement of the star's visual magnitude to 18.0, about a magnitude brighter than originally estimated (Ken Croswell, 2005). According to an email from Todd Henry of RECONS to Tom Whiting in 2008, a more precise but unpublished parallax found the star to be 25.8 +/- 0.2 ly from Sol, but still within 10 parsecs. Up-to-date technical summaries on these stars may become available at: the Research Consortium on Nearby Stars (RECONS) list of the 100 Nearest Star Systems, the NASA Star and Exoplanet Database, and the SIMBAD Astronomical Database. New research papers on these stars may eventually become available at the SAO/NASA ADS. Note: Special thanks to Rob Pierce for notifying us of updated information on both SIPS 1259-4336 and SSPM J1549-3544, and also to Charles Steevens for notifying us of the discovery of WISE J163940.83-684738.6, WISE J052126.29+102528.4, and WISE J2000+3629.